Hello everyone! Here's my project for the 7 Kids Challenge Blog, "Anything Goes". Make sure you use a STAMP/IMAGE carried in the 7 Kids College Fund Store in order to qualify. 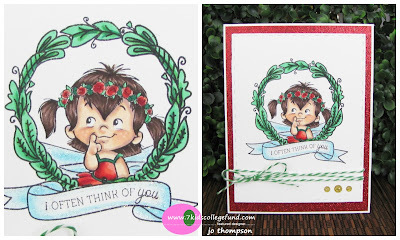 Another holiday card for you, using C.C. Designs - Iggy. She is colored with Copic Markers and the sentiment is from Avery Elle - Penguin Greetings. Aren't those baby penguins adorable?! I covered her outfit and igloo with Star Dust Stickles, I can't get enough! I used enamel dots for the center of the snowflakes. Hello everyone! 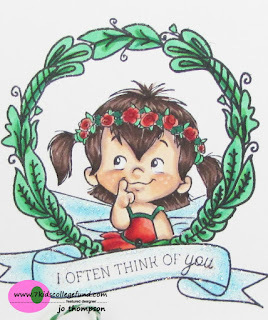 Here's my project for the 7 Kids Challenge Blog, "Anything Goes" with an "Optional Twist - Give Thanks". Make sure you use a STAMP/IMAGE carried in the 7 Kids College Fund Store in order to qualify. Loved making this card. 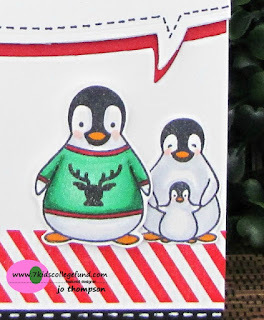 The adorable penguins are from Avery Elle - Penguin Greetings, but I wonder why the Daddy P is the only one that has clothes? Maybe that's why Mama P is strategically placing Baby P in front of her? LOL Who knows. The coloring is kept simple. The sentiment "Special Delivery" and the candy cane stripes are from Avery Elle - Naughty or Nice. To fill up the space up top, I used the Mama Elephant - Speech Trio die as a base for the sentiment. Lastly, glued on some green sequins, added some faux stitching and a strip of black cs to finish the card. 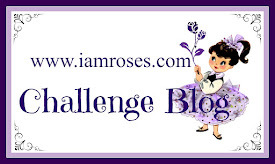 Come play with us over at the 7 Kids Challenge Blog! Thanks for stopping by and have a fabulous Wednesday! Happy Saturday! 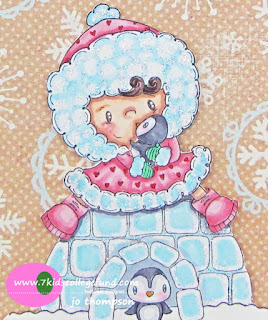 There's still time to join the 7 Kids Challenge Blog, "Anything Goes". Make sure you use a STAMP/IMAGE carried in the 7 Kids College Fund Store in order to qualify. I played around with masking images and this is what I came up with. I used the Mama Elephant - Charmed stamp set and C.C. Designs - Roberto's Rascals Fairy Twila. These two were made for each other! The images are colored with Copic Markers and Star Dust Stickles added some shimmer/glitter to her wings and banner. 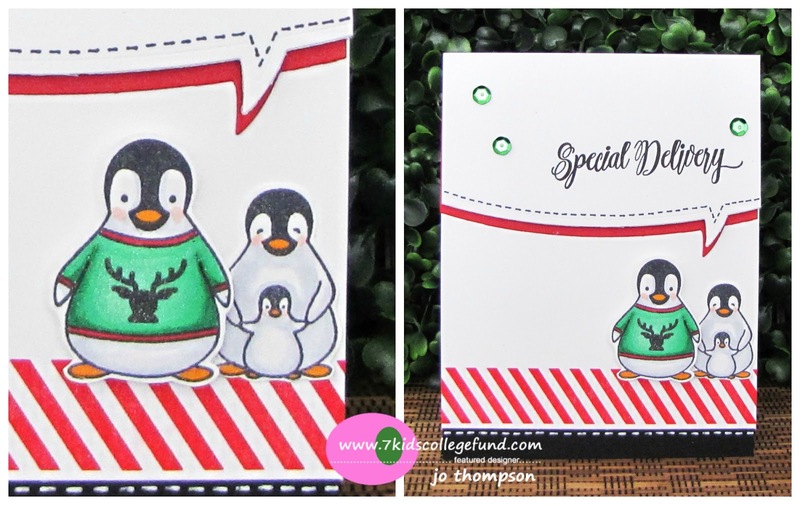 The bottom layer of the layout is red glitter cardstock and then the image base is popped up on dimensional adhesive. Lastly, added some twine and glitter enamel dots. Using the color combo of red, turned this into a holiday card. 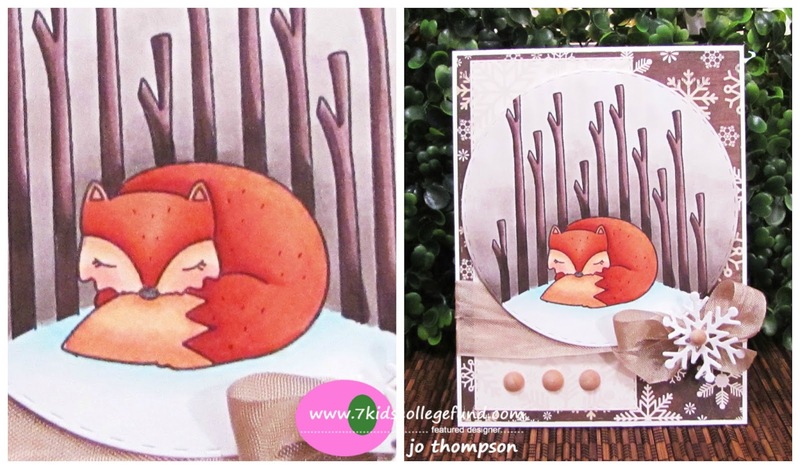 Come play with us over at the 7 Kids Challenge Blog! Thanks for stopping by and have a crafty weekend! 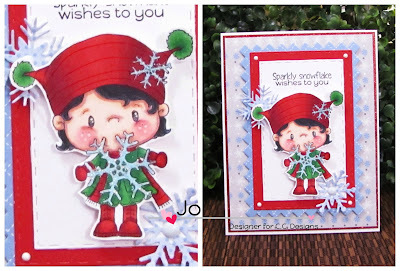 Hi everyone, i'm sharing Pollycraft - Snowflake from this month's C.C. Designs November Release. What an adorable image! She is colored with Copic Markers and kept it simple. I added some Star Dust Stickles on the snowflakes. 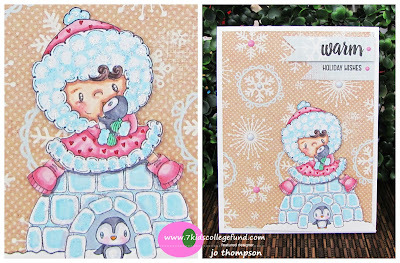 I used several of the new dies to frame her out: Pinky Rectangles, Rectangles #1, Snowflakes. Lastly, I added some enamel dots from Merry Christmas and Snow Day Enamel Dots. Thanks so much for stopping by. 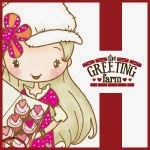 I hope you are enjoying the release and that you are getting a head start on your holiday cards! Today is the official RELEASE DAY for all of our new November products!! As you have seen from our Preview Days, all of these items are perfect for upcoming holidays and wintry days. You can view the entire release HERE! We have 15 Character Stamps, 1 Sentiment Stamp Set, Snowflake Die Set, Make A Card #11 Winter Die, Snowy Day Enamel Dots, and 1 new Snowy Day 6x6 Paper Pad. I told you....this release is AMAZING!! 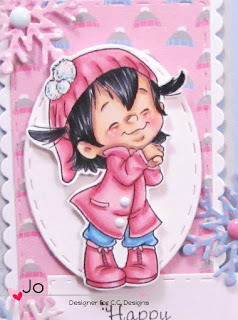 Here's my card using the cutie Roberto's Rascals - Happy Twila. She is colored with Copic Markers. I added some Stickles to her pom poms on her beanie. 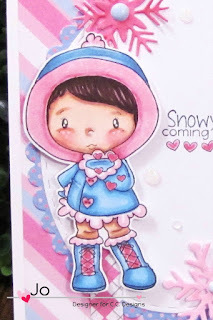 How perfect is the coordinating paper from the Snowy Day Paper Pad! 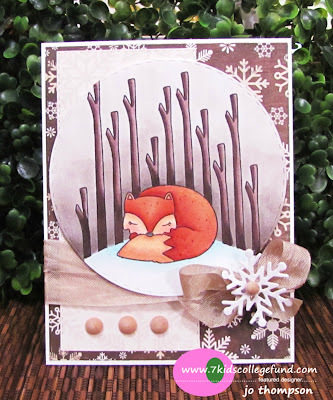 I used several dies; Snowflakes, Rectangles, Ovals and Make A Card #9 Autumn. The center of the snowflakes and the buttons on her coat are from the Snow Day Enamel Dots. 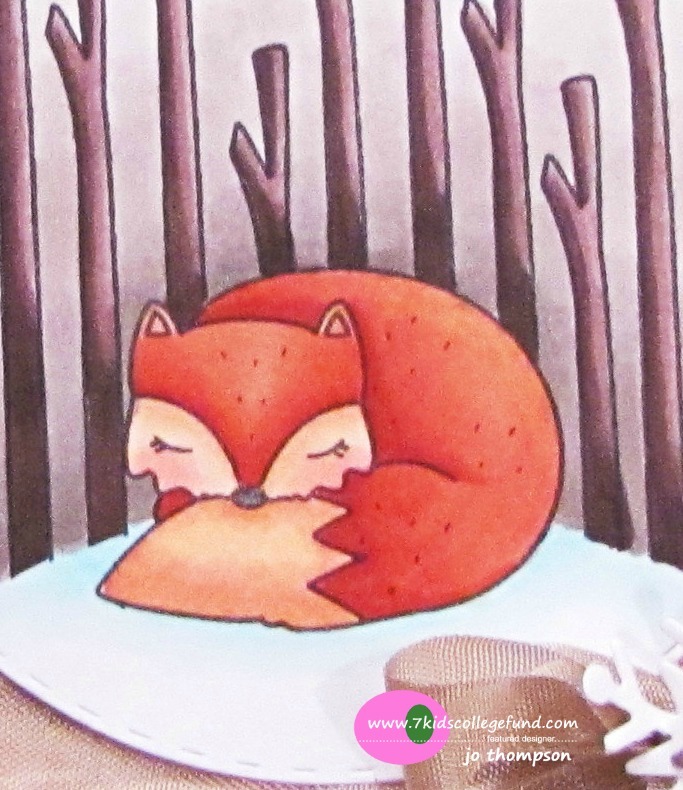 Going forward, we will have a New Release Blog Hop with every release to showcase our talented Design Team! If you get lost along the way, this is our hopping list. Leave a comment on each DT Member’s Blog, and then head back to the C.C. 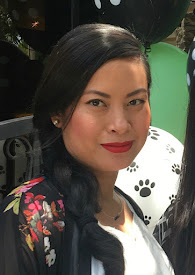 Designs Blog to let us know you completed the hop. 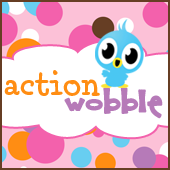 One random winner will receive a prize for completing the blog hop!! 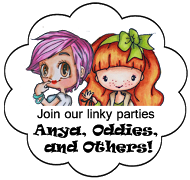 **This Blog Hop will end on Sunday, November 8th at NOON, 12pm EST! Winners will be announced the following week! There are also 3 more chances to win prizes on the C.C. 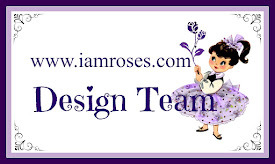 Designs Facebook Page!! Head over and join us for more fun! Love how this card turned out. I used the Mama Elephant - Charmed stamp set. My previous card used the owl and wreathe, this time I used the fox. 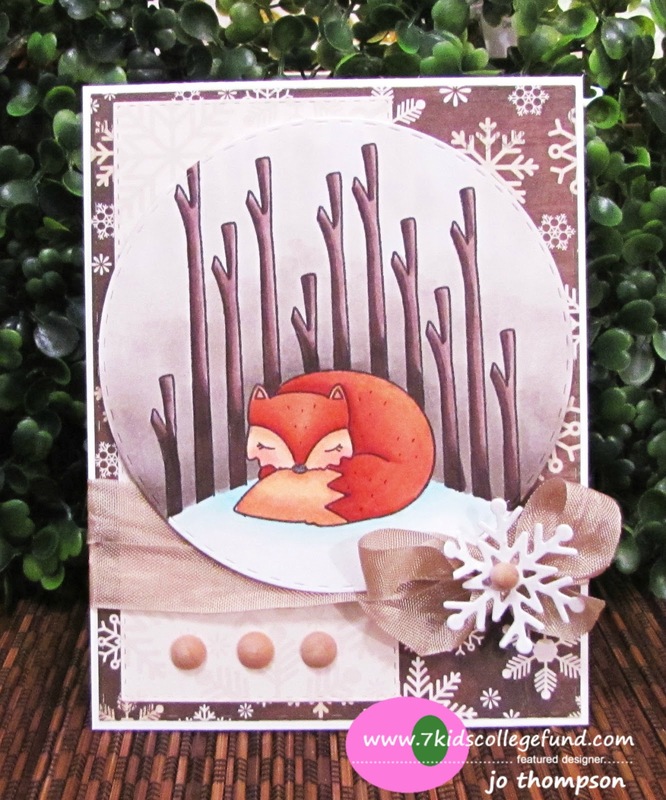 I did some masking with the image and created a little scene of him in the snow against a backdrop of branches. The image is colored in with Copic Markers. It's a simple layout and I added some snowflake and wooden enamel dots for the embellishments. I wrapped a small bow around the card with seam binding. I wanted the image to be the main focus on the card. Happy C.C. 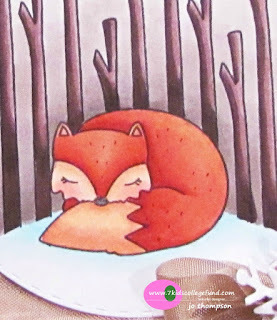 Designs Rubber Stamps November Release PREVIEW Day 1!! 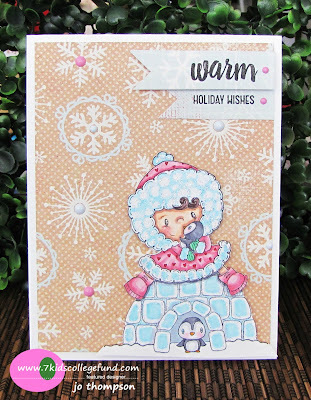 Today I am previewing Winter Kisses Lucy, don't you love that she's blowing kisses! She is one of the many cuties for this November Release. I colored her with Copic Markers. Those awesome snowflake die cuts are cut from C.C. Design Cutters - Snowflakes. The designer paper I used is Snowy Day Paper Pad. 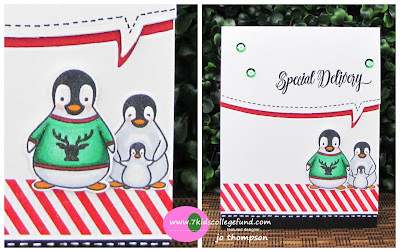 If you are looking for a an alternative Christmas color combo, this is the paper pad for you. 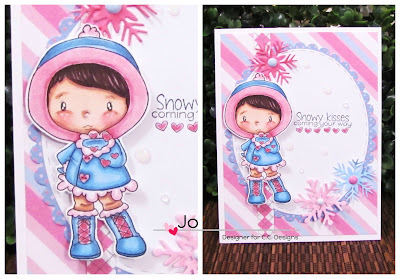 The sentiment "Snowy kisses coming your way" is from Snowy Sentiments. Thanks for stopping by! This November Release is sure to get you in the holiday spirits. Make sure to check out the whole release and the other projects from the DT over at the CC Designs Blog. Also, head on over to the C.C. Designs FB Group, we will be doing Giveaways every Preview Day!